for wounded military veterans following the events of September 11th. $1 off Smoothies ALL DAY!! – FINS Fantasy Surf League – JOIN NOW – Win Big! THANK YOU Alesia for the awesome Google Review! Serving up fun new specials to spice up your taste buds! Tuna Poke: Bite sized Ahi Tuna, tossed in a light Hawaiian Marinade w/ Hot Peppers, Sesame Seeds, Scallions & Cilantro. Chilled & served with Seaweed Salad, Mango & Pickled Ginger. When you give your Phone # your saving points! 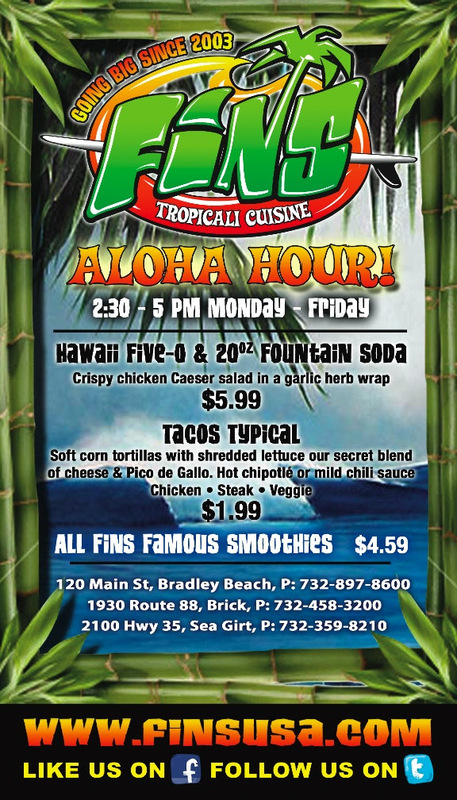 Right now when you reach 300 points FINS will be giving away FREE NJ Tees or a FINS Reusable canvas shopping bag, or as always 15% off your order!